For many wrestlers, their battles begin and end on the mat. For Steven Melendez, his continues well off the mat. Imagine waking up each day and not knowing if you can see what you were able to the day before. "“It can be very disheartening to me, wanting to see something but not being able to see or distinguish what it is or what it looks like,” Melendez said. For the Mira Monte student-athlete, he's been in that exact circumstance since a diagnosis of Retinitis Pigmentosa (RP) at eight years old. “But I still keep my head high and stay positive," Melendez said. The genetic disorder means his vision will slowly decrease over time until it could eventually lead to total blindness. But sure enough, Melendez found his own light: sports. He proves that on the wrestling mats. A sport that already requires a lot from it's competitors says Mira Monte wrestling coach Efren Cisneros. “It works for him because it’s more balance, counterweight, knowing how to move your body. It’s a reaction. You don’t always need to see it coming but you’re going to have to know how to react to something," Cisneros said. And Steven's coach knows he has always had the right response on and off the mats. “Can’t see too many grown men or grown people deal with that kind of situation like he’s dealing with it," Cisneros said. RP is a disorder that the Melendez family was used to as both of Steven's sisters also have it. 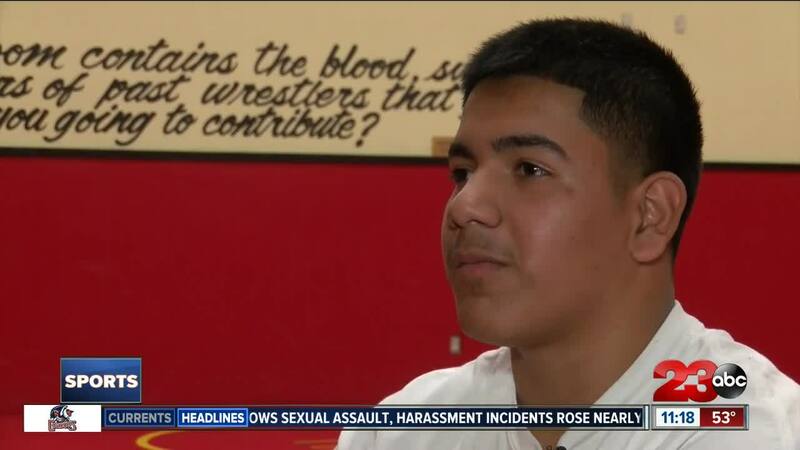 “I don’t think any parent wants to see their children in that circumstance," Melendez said. " Whether for his family at home, his family on the mats or just for himself, Steven keeps fighting. We may not see what Steven sees, but if we listen to him, we may be able to learn something.